What is often called a "mezuzah" is actually a "mezuzah cover." The real mezuzah is the scripture itself also contained in this package. 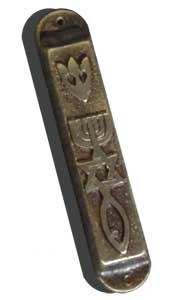 Made of brass this mezuzah measures 3/4"x4"x1/2".